We are now in the home stretch. Another long night of sleep (thank you daylight savings). This morning I took my final lithium (good riddance). Carrie and the kittens come home this afternoon, though nobody gets a hug yet. I want to put up a “welcome home, girls!” banner. But first, I have a lot of laundry to do — all of the bedding, and everything I wore, and I also need to clean the bathroom very thoroughly. This morning’s Geiger counter reading is 27.4 µSv/hr, so we’re moving in the right direction. It definitely varies around my body. 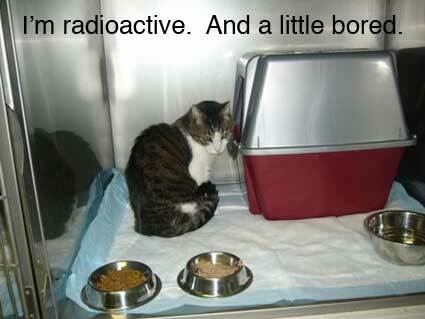 And you have to be pretty close to me to get any radiation at all. I made a recording for you. The Geiger counter is no longer screaming so you get a clearer sense of how much radioactivity there is depending on my position. In other news, when Carrie stopped by Friday night, she picked up our older, bigger cat carrier because they no longer fit in the small one. 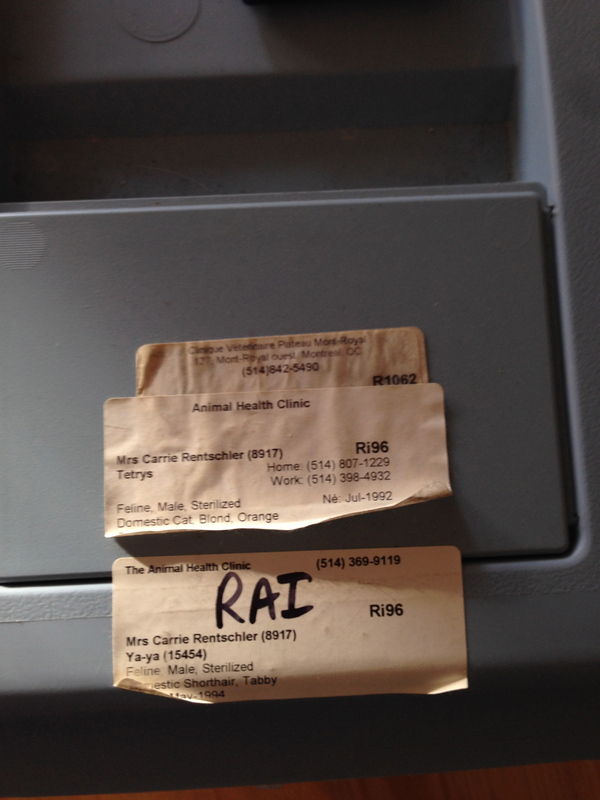 In some kind of poetic convergence, the RAI stickers for our last two cats (one and two) are still on the carrier. There was a time when Carrie was the only being in the house with a working thyroid. 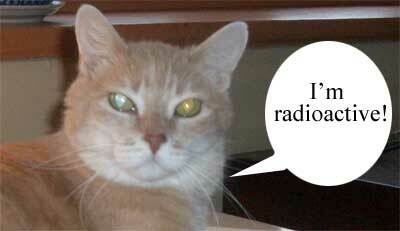 Now we’ve got 3 working thyroids again. And so turns the circle of life….